The shot above is pretty horrendous, of course, but that's expected at 1/6th second handheld, freestanding, while on a bridge that quivers as people and vehicles pass. 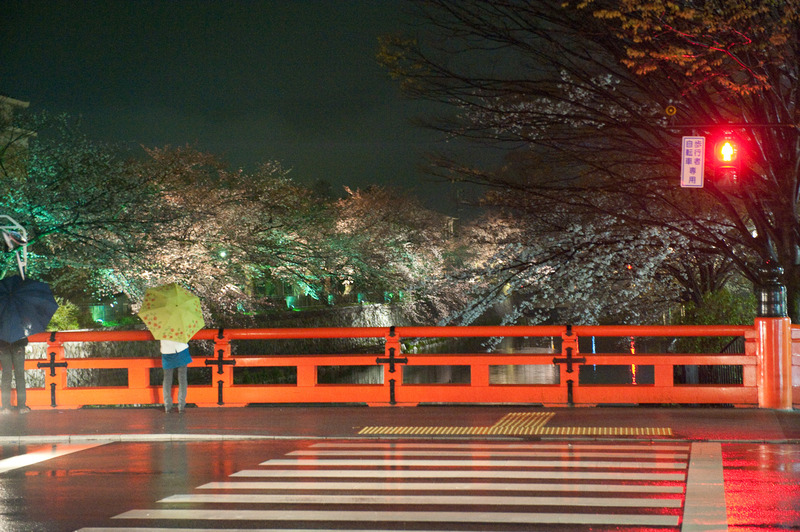 It pretty much reflects the mood for the cherry blossoms in Kyoto this year. We were on track for a slightly early season, but just after some of the trees started to flower, we were hit with a long cold snap that continues, so the blossoms have been struggling. 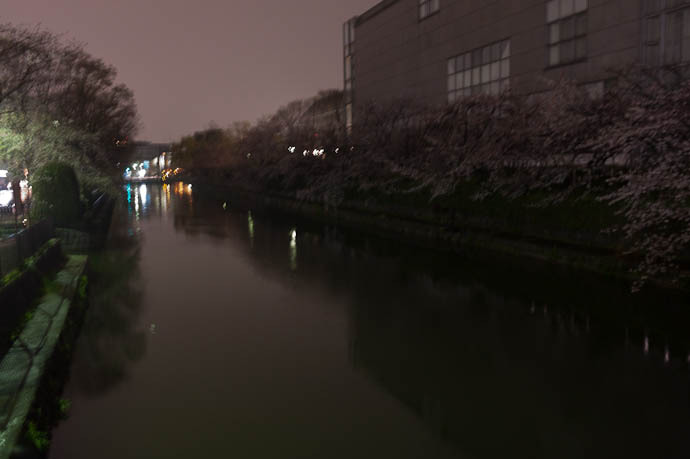 The cherry-blossom lightup that my area of Kyoto holds every year is scheduled for just three days this year (yesterday, today, and tomorrow), but we're nowhere near full bloom yet. 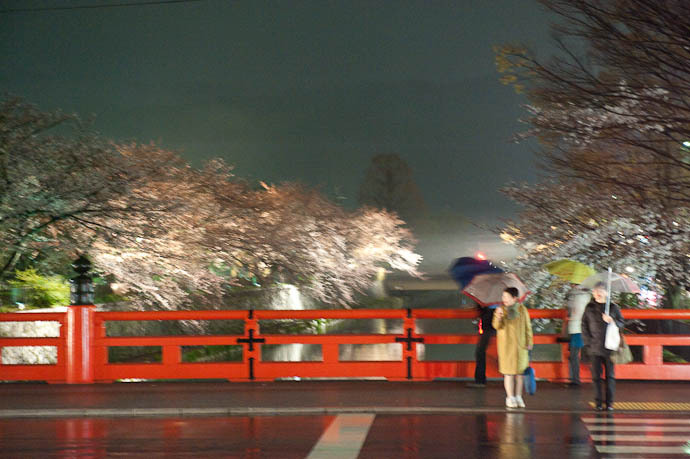 Last year, by comparison, was spectacular, as I attempted (but failed) to capture in my Kyoto Cherry-Blossom Lightup, 2008 post. The Nikon D700's low-light ability is astounding, as I've shown before (especially in Pushing Lowlight-Photography Limits: The Atta Terrace Hotel at Night), but this was a ridiculous situation that I didn't even bother trying to rectify, and hence we have the ridiculous result seen above. 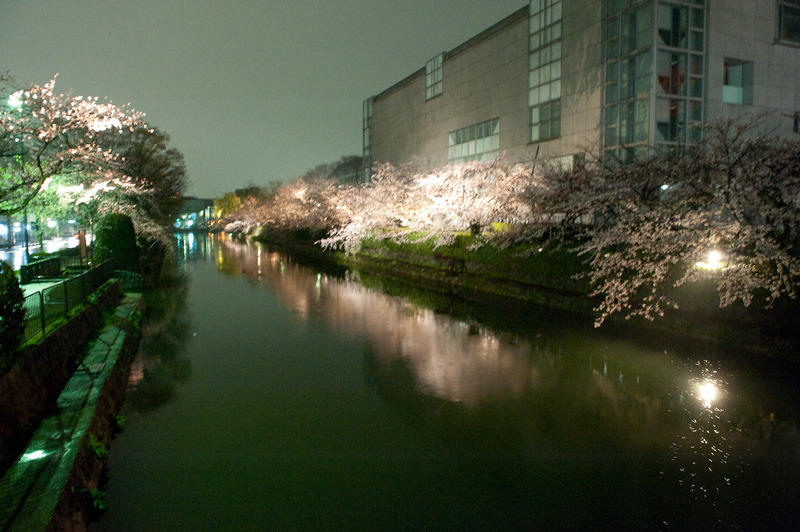 Actually, the camera's meter way overexposed the shot, making it look like daytime. What you see above is the result after I dropped the exposure by about 3EV in post. The D700 tends to overexpose in the dark, as I've mentioned before (“In the Ballpark of Hope: Okinawan Grave In the Dark”, and in “Impossible Photography: No Light, No Tripod, No Hope. D700 and a 50mm f/1.2”). Perhaps it's just trying to show off. Some of the lights were still warming up, and unlike our eyes/brain which can compensate for the off color (making all the lights appear more or less “white”), the camera can't so you get a mix of colors. The fact that those were handheld in such low light is pretty incredible for the amount of blurriness, I’d have expected a lot more. I like the composition in the last one and the colors are so out of the “ordinary” and really make it outstanding instead of just pretty, it’s more than “sorta” pretty, at least in my tastes. I disagree with you about that first photo. It’s a great shot, summing up the mood and atmosphere. Blur is not always a bad thing, even if inadvertent. One of your best shots, I think.